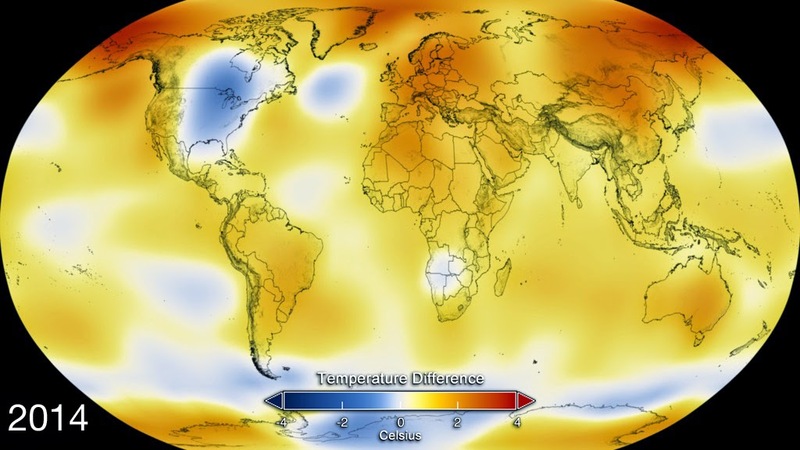 Color-coded map which displays global temperature anomaly data from 2014. Photo credit: NASA’s Goddard Space Center. On Friday the US government bodies National Oceanic and Atmospheric Administration (NOAA) and the National Aeronautics and Space Administration (NASA) confirmed that 2014 was the hottest year ever recorded (records officially began in 1880). Two independent studies by NOAA and NASA’s Goddard Institute of Space Studies (GISS) confirmed that ten of the hottest years on record have occurred since 2000. Climate scientists and environmental groups will claim that this new data makes arguments against anthropogenic climate change even harder to back up. The video above released by NASA on Friday video confirms 2014 as the hottest year ever. ← Is Pope Francis the world’s new climate champion?